These Enchiladas with homemade red enchilada sauce is the last recipe of its kind that you will need to look for. There is nothing better than making delicious food with totally fresh ingredients, which is a common characteristic of authentic Mexican cuisine. Ever since I shared my recipe for enchiladas verdes here on my site, people have been asking me to share my enchiladas rojas (red enchiladas) recipe. Today, I am going to do just that. 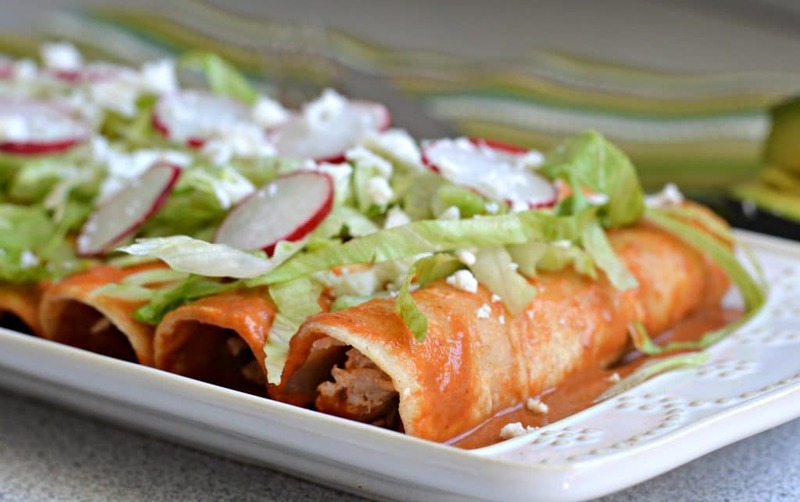 Keep reading to find out how how to make these delicious enchiladas with a homemade, creamy, and delicious red enchilada sauce. The key to what makes this recipe great is the homemade red enchilada sauce. It is made with dry chilies, that you can find online or in the Hispanic section at your local grocery store. To add the perfect amount of creaminess, this enchilada sauce includes a touch of heavy whipping cream. 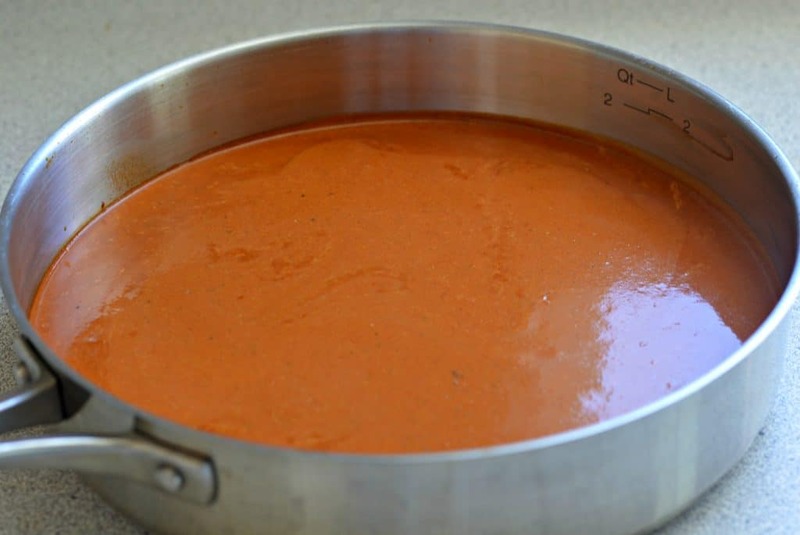 You can find pre-made red enchilada sauce in most store in many different varieties, but there is nothing like this homemade version. One bite, and you will believe me! 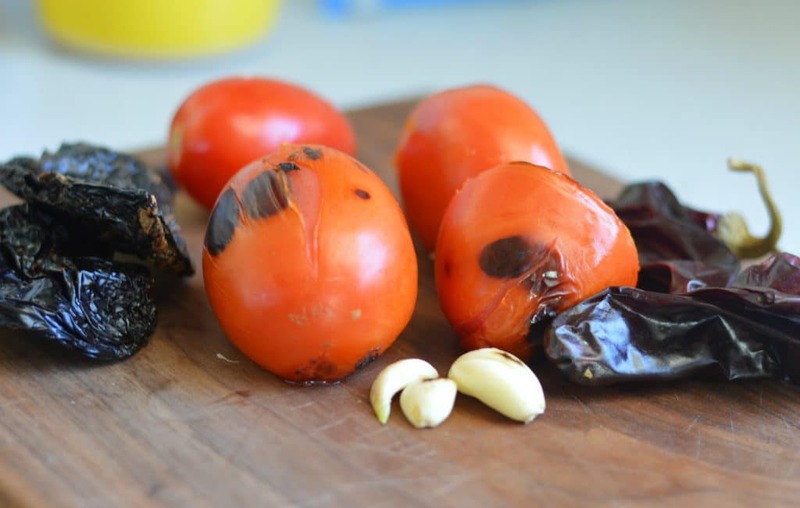 For this recipe you will need 2 ancho chilies, and 3 Anaheim or guajillo chilies. They will need to be de-seeded and boiled. If you need a refresher on how to do that, check it out on my barbacoa tacos recipe. You will also need 4 fresh tomatoes, 2 cloves of garlic, and 1/4 onion, all lightly charred. Finally, you will also need 2 tablespoons of sour cream (separate from the heavy whipping cream). You will blend all of the ingredients together, before straining out any leftover seeds and heating it up before adding to the the enchiladas. The chicken filling is almost as important as the sauce in making sure that these red enchiladas are the best ever. This recipe reminds me of growing up in Mexico when my mom would always make this easy recipe on the weekends so that we had more time to do family activities. I remember how my mom always used to teach me how to season the sauce and the chicken filling while we spent time together talking and having fun. 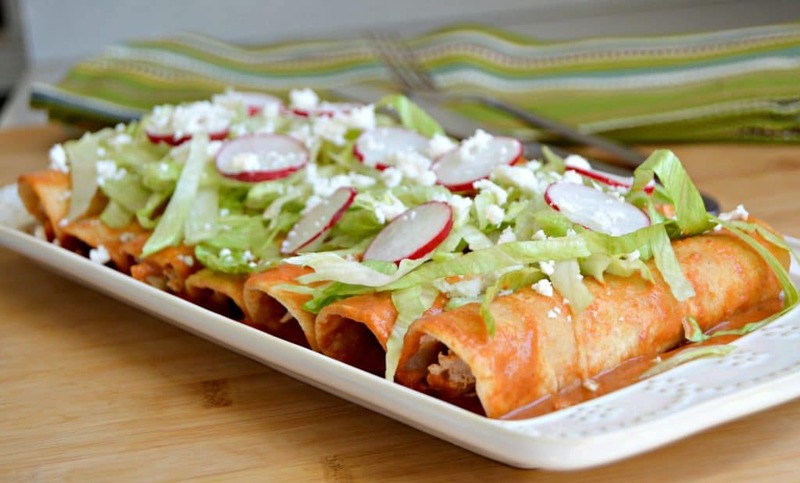 These delicious red enchiladas go great with freshly chopped lettuce and radishes, and topped with queso fresco – or any other cheese that you want. My husband uses mozzarella, because he is not a big fan of queso fresco. Another great thing about these enchiladas is that they don’t have to be baked, but they can be! We have tried them both way, and both are delicious! How did they turn out for you? Once you try this red enchilada sauce, you will never need to buy store-bought again! 2 Ancho Chilies dried, de-seeded and boiled. 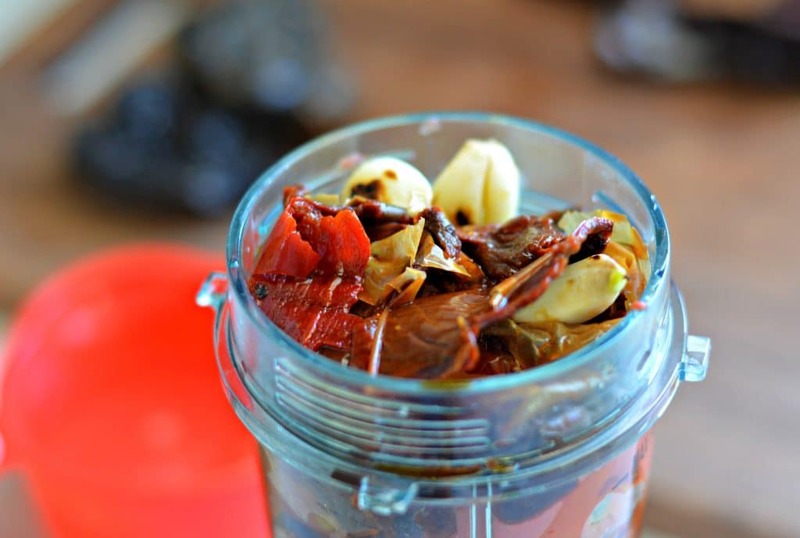 3 dried Guajillo or Anaheim Pepper de-seeded and boiled. Combine all of the ingredients for the sauce except for the heavy whipping cream, and blend until smooth. Strain out any seeds and add to a skillet, bringing to a slight boil. Add the heavy whipping cream, and let boil for 5 additional minutes. Reduce heat to low. 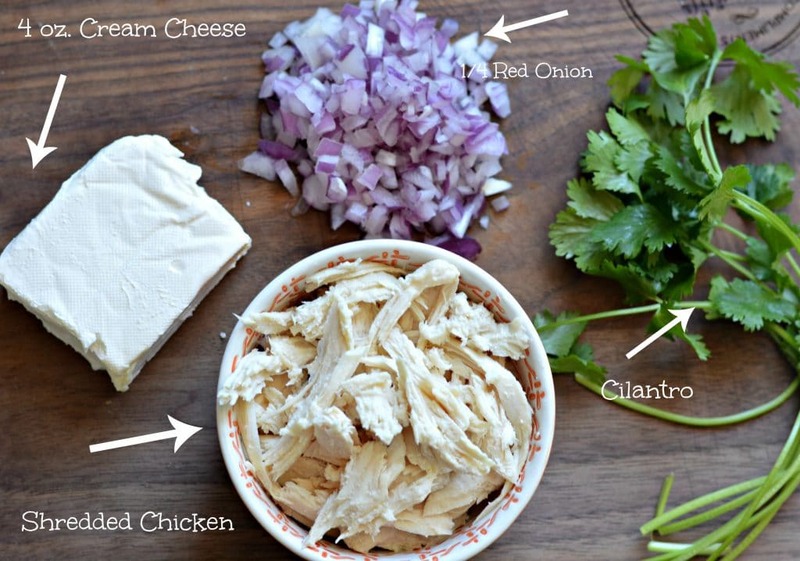 In a hot skillet, add a small amount of olive oil and then add the shredded chicken, the onion, and the cilantro. After about 5 minutes, add the cream cheese, and stir in with the chicken until well incorporated. Season with salt and pepper and let cook for an additional five minutes. Lightly fry the corn tortillas in oil and pay dry. 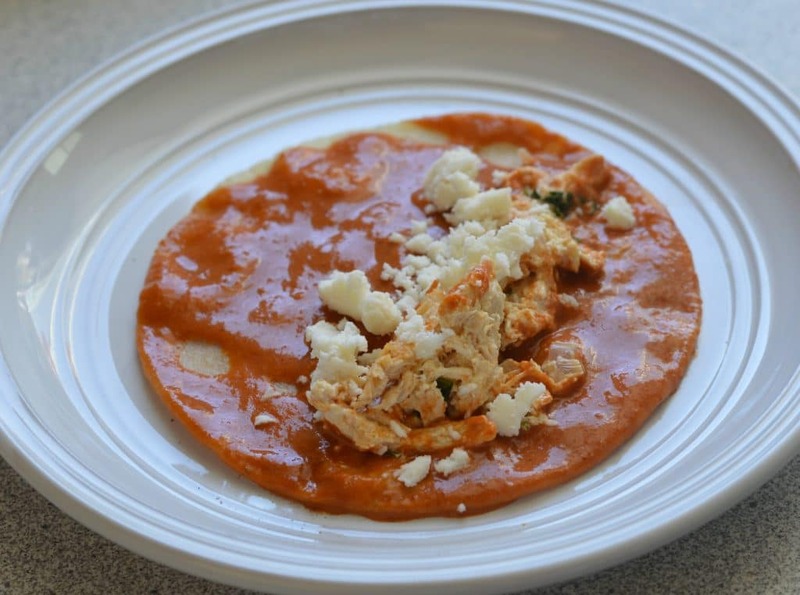 Dip each tortilla in the red enchilada sauce, covering both sides completely. Fill each tortilla with some of the chicken filling, and some cheese if desired. At this point you can add them to a baking dish, top with mozzarella cheese and bake at 400 degrees for 15 minutes. If you do not want to bake them, just put them on a plate, top with lettuce, cheese, and radish and serve immediately. « Enchiladas en salsa de chile roja muy cremosa! Could I make the enchilada sauce ahead of time and freeze it? Hi Heather – I have never frozen this sauce in particular, but I don’t think that would be a problem at all! If you decide to freeze it, let me know how that works for you. Good luck! Awesome thanks! I made the sauce yesterday so I can divide up the labor. We made these before (but did it all in one day) and they were DELICIOUS! We used to live in El Paso and had so many authentic Mexican food options, but there aren’t really any where we live now, so this recipe is our go-to now to satisfy the cravings. SO good! I’ll have to let you know how they turn out with the frozen sauce. Thanks for the recipe! I’m so glad it turned out so well for you! Let me know how the frozen sauce turns out! I made the enchiladas tonight after heating up the sauce from the freezer, and it all turned out great! I’m thankful to have a second batch of frozen sauce in my freezer for next time 😀 Thanks again for the fantastic recipe! Hi Melinda – This should be plenty of sauce for 6 people. If you just figure out about how many enchiladas each person will eat, just adjust the amount of tortillas accordingly. The chicken mix and the sauce should be enough though. Hope that helps! Hi Mai – sorry for the delay in my response! You can boil them all together or separately. It really doesn’t matter as long as they are boiled. Good luck! My family n I thank you for sharing this nomalicious recipe! The toddler and teen both gobble it up, and is still tasty leftover! Thanks again! Thanks Jenny! I’m glad that you and your family enjoyed it! Wow what an amazing recipe!! I used Serrano Chile’s instead of ancho because that’s all I could find at my grocery story and it turned out great still. My boyfriend is Hispanic and he loved these. Said they tasted almost like his mother’s. I will be making this again!!!! I have been looking for a red sauce that is authentic and this looks like it will fit the bill. I have made homemade beef tamales with homemade red sauce and they were awesome. 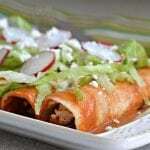 I will be getting the chilies tomorrow so I can make your enchiladas! Thanks for the comment Julianne! I hope it turns out great for you. Let me know if you have any questions. I will make this one night this week, but I was wondering if you could use Schroeder beef instead of chicken? If so, would you change any other ingredients? Hi Kem! Yes, you can definitely swap out the chicken for shredded beef. I don’t think you would need to make any other adjustments. Sounds tasty! Do you need to use heavy cream? Can I substitute? Hi Angela – the heavy cream is not 100% necessary. I like to add it for some extra creaminess, but I have made it many times without it as well and it still turns out great. Good luck! Why don’t you fry your sauce like every other authentic recipe? I’ve read that that’s the most important step but is it? Hi – there are many different ways to make enchilada sauce, based on the region of Mexico where it is coming from. This is the recipe that I grew up making and I don’t see any benefit that would come from frying the sauce. This sauce is very flavorful, which comes from the natural taste of the chiles and from grilling the tomatoes, garlic, and onions. In any case, this is how this recipe is prepared and it has always turned out great for me. Hopefully, you will give it a try and it will turn out great for you as well. Good luck! I made the sauce tonight and I think I screwed up. I followed the recipe exactly but the sauce was very thick and had a heavy tomato flavor. Maybe that’s right? Or maybe my tomatoes were too big? Sorry, Steve! I am not sure what could have gone wrong. There should be some tomato flavor, but it shouldn’t be overwhelming. Did you make sure to roast the tomatoes first? I will update the recipe to specify that roma tomatoes are best. If you use larger tomatoes, you will probably want to reduce the quantity. I haven’t had the issue with it being thick before, so I’m thinking it must have had something to do with the tomatoes. You can always add a small amount of water to thin it out, but that shouldn’t be necessary. Maybe I’m overlooking when the sour cream is added. Also, when boiling the peppers and bits, you referred to the barbacoa recipe for instructions. I was unsure where to stop that recipe and pick back up with this one. Do you follow through the vinegar and stock, or stop at boiling and straining. Thanks.